Molly Pitcher is a nickname given to a woman said to have fought in the American Battle of Monmouth, generally believed to have been Mary Ludwig Hays McCauley. However, various Molly Pitcher tales grew in the telling, and many historians regard Molly Pitcher as folklore rather than history, or suggest that Molly Pitcher may be a composite image inspired by the actions of a number of real women. The name itself may have originated as a nickname given to women who carried water to men on the battlefield during War. 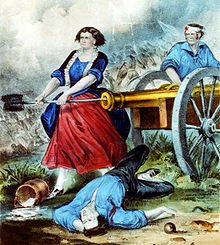 The deeds in the story of Molly Pitcher are generally attributed to Mary Ludwig Hays. Molly was a common nickname for women named Mary in the Revolutionary time period. Biographical information about Mary Hays has been gathered by historians, including her cultural heritage, given name, probable year of birth, marriages, progeny, and census and tax records, providing a reasonably reliable account of her life. Mary Ludwig was born in Philadelphia, Pennsylvania. There is some dispute over her birth date, but a marker in the cemetery where she is buried lists her birth date as October 13, 1744. She had a moderately sized family which included her older brother Johann Martin; their parents were Maria Margaretha and Johann George Ludwig, who was a butcher. It is likely that she never attended school or learned to read, as education was uncommon among girls at this time. Her father died in January 1769, and her mother married John Hays the following June. In early 1777, Molly married William Hays, a barber in Carlisle, Pennsylvania. Continental Army records show that he was an artilleryman at the Battle of Monmouth in 1778. Dr. William Irvine organized a boycott of British goods as a protest of the Tea Act on July 12, 1774, in a meeting in the Presbyterian Church in Carlisle, and William Hays' name appears on a list of people who were charged with enforcing it. In 1777, William Hays enlisted in Proctor's 4th Pennsylvania Artillery, which became Proctor's 4th Artillery of the Continental Army. During the winter of 1777, Molly Hays joined her husband at the Continental Army's winter camp at Valley Forge, Pennsylvania. She was one of a group of women, led by Martha Washington, who would wash clothes and blankets and care for sick and dying soldiers. In early 1778, the Continental Army trained under Baron Friedrich Wilhelm von Steuben. Hays trained as an artilleryman, and Mary and other camp followers served as water carriers, carrying water to troops who were drilling on the field. Also, artillerymen needed a supply of water to soak the sponge used to clean sparks and gunpowder out of the barrel after each shot. It was during this time that Mary probably received her nickname, as troops would shout, "Molly! Pitcher!" whenever they needed her to bring fresh water. At the Battle of Monmouth in June 1778, Mary Hays attended to the soldiers by giving them water. Just before the battle started, she found a spring to serve as her supply, and two places on the battlefield are now marked as the "Molly Pitcher Spring." She spent much of the early day carrying water to soldiers and artillerymen, often under heavy fire from British troops. The weather was very hot, and William Hays collapsed during the battle, either wounded or suffering from heat exhaustion. It has often been reported that he was killed in the battle, but it is known that he survived. As he was carried off the battlefield, Mary took his place at the cannon and continued to "swab and load" the cannon using her husband's ramrod. At one point, a British musket ball or cannonball flew between her legs and tore off the bottom of her skirt. She supposedly said something to the effect of, "Well, that could have been worse," and went back to loading the cannon. Joseph Plumb Martin recalls an incident in his memoirs, writing that at the Battle of Monmouth, "A woman whose husband belonged to the artillery and who was then attached to a piece in the engagement, attended with her husband at the piece the whole time. While in the act of reaching a cartridge and having one of her feet as far before the other as she could step, a cannon shot from the enemy passed directly between her legs without doing any other damage than carrying away all the lower part of her petticoat. Looking at it with apparent unconcern, she observed that it was lucky it did not pass a little higher, for in that case it might have carried away something else, and continued her occupation." However, there is no mention of the woman Martin describes serving the gun crews with water, nor of her husband becoming a casualty. Later in the evening, the fighting was stopped due to gathering darkness. Although George Washington and his commanders expected the battle to continue the following day, the British forces retreated during the night and continued on to Sandy Hook, New Jersey. After the battle, General Washington asked about the woman whom he had seen loading a cannon on the battlefield. In commemoration of her courage, he issued Mary Hays a warrant as a non commissioned officer. Afterwards, she was known as "Sergeant Molly," a nickname that she used for the rest of her life. Following the end of the war, Mary Hays and her husband William returned to Carlisle, Pennsylvania. During this time, Mary gave birth to a son named Johanes (or John). In late 1786, William Hays died. In 1793, Mary Hays married John McCauley, another Revolutionary War veteran and possibly a friend of William Hays. McCauley was a stone cutter for the local Carlisle prison. However, the marriage was reportedly not a happy one, as McCauley had a violent temper. It was McCauley who was the cause of Mary's financial downfall, causing Mary to sell 200 acres (81 ha) of bounty land left to her by William Hays, for 30 dollars. Sometime between 1807 and 1810, McCauley disappeared, and it is not known what happened to him. Mary McCauley continued to live in Carlisle. She earned her living as a general servant for hire, cleaning and painting houses, washing windows, and caring for children and sick people. "Sergeant Molly," as she was known, was often seen in the streets of Carlisle wearing a striped skirt, wool stockings, and a ruffled cap. She was well liked by the people of Carlisle, even though she "often cursed like a soldier." On February 21, 1822, the Commonwealth of Pennsylvania awarded Mary McCauley an annual pension of $40 (equivalent to $753 in 2018) for her service. Mary died January 22, 1832, in Carlisle, at the approximate age of 78. She is buried in the Old Graveyard in Carlisle, under the name "Molly McCauley" and statue of "Molly Pitcher," standing alongside a cannon, stands in the cemetery. The story of Margaret Corbin bears similarities to the story of Mary Hays. Margaret Corbin was the wife of John Corbin of Philadelphia, Pennsylvania, also an artilleryman in the Continental army. On November 16, 1776, John Corbin was one of 2,800 American soldiers who defended Fort Washington in northern Manhattan from 9,000 attacking Hessian troops under British command. When John Corbin was wounded and killed, Margaret took his place at the cannon, and continued to fire it until she was seriously wounded in the arm. In 1779, Margaret Corbin was awarded an annual pension of $50 by the state of Pennsylvania for her heroism in battle. She was the first woman in the United States to receive a military pension. Her nickname was "Captain Molly". Molly Pitcher (1884) by James E. Kelly, Monmouth Battle Monument, Freehold, New Jersey. In 1928, "Molly Pitcher" was honored with an overprint reading "MOLLY / PITCHER" on a United States postage stamp. Earlier that year, festivities had been planned to celebrate the 150th anniversary of the Battle of Monmouth. Stamp collectors petitioned the U.S. Post Office Department for a commemorative stamp to mark the anniversary. After receiving several rejections, New Jersey congressman Ernest Ackerman, a stamp collector himself, enlisted the assistance of the majority leader of the House, John Q. Tilson. Postmaster General Harry New steadfastly refused to issue a commemorative stamp specifically acknowledging the battle or Molly Pitcher. In a telegram to Tilson, Postmaster New explained, "Finally, however, I have agreed to put a surcharged title on ten million of the regular issue Washington 2¢ stamps bearing the name 'Molly Pitcher.'" Molly was finally pictured on an imprinted stamp on a postal card issued in 1978 for the 200th anniversary of the battle. "Molly" was further honored in World War II with the naming of the Liberty ship SS Molly Pitcher, launched, and subsequently torpedoed, in 1943. The stretch of US Route 11 between Shippensburg, Pennsylvania, and the Pennsylvania-Maryland state line is known as the Molly Pitcher Highway. The Field Artillery and Air Defense Artillery branches of the US Army established an honorary society in Molly Pitcher's name, the Honorable Order of Molly Pitcher. Membership is ceremoniously bestowed upon wives of artillerymen during the annual Feast of St. Barbara. The Order of Molly Pitcher recognizes individuals who have voluntarily contributed in a significant way to the improvement of the Field Artillery community. The U.S. Army base Fort Bragg holds an annual event called "Molly Pitcher Day," showcasing weapon systems, airborne operations, and field artillery for family members. Molly Pitcher Inn is a hotel in Red Bank, New Jersey, not far from the site of the Battle of Monmouth. Molly Pitcher Service Plaza is a New Jersey Turnpike rest area. The State of Tennessee became the second State in the Union (preceded by West Virginia) to offer their women veterans a license plate honoring their service. The plate depicts Molly Pitcher, recognizing women in combat from the beginnings of the nation. On I-95 (New Jersey Turnpike) a service area is named Molly Pitcher Service Area in Cranbury Township, New Jersey. There is a reference made to Molly Pitcher in season four, episode nine of the AMC television show Turn: Washington's Spies. ^ Will the Real Molly Pitcher Please Stand Up? Teipe, Emily J. ^ The Real Pennsylvania Dutch American, "Molly Pitcher"
^ a b c d e f Koestler-Grack, Rachel A. Molly Pitcher: Heroine of the War for Independence. Philadelphia: Chelsea House Publishers, 2006. ISBN 0-7910-8622-4. ^ a b c Rockwell, Anne They Called Her Molly Pitcher. New York: Alfred A. Knopf, 2002. ISBN 0-679-89187-0. ^ "Pitcher, Molly." Encyclopædia Britannica. 13 February 2007. ^ a b Hotchner, William M. (2008-08-25). "The scandal surrounding the Molly Pitcher overprint stamp of 1928". Linn's Stamp News. Amos Press Inc. p. 6. Downey, Fairfax. 1956. "The Girls Behind the Guns". American Heritage. 8, no. 1: 46-48. Bohrer, Melissa Lukeman. Glory, Passion, and Principle: The Story of Eight Remarkable Women at the Core of the American Revolution. New York: Atria Books, 2003. ISBN 0-7434-5330-1. Raphael, Ray. Founding Myths: Stories That Hide Our Patriotic Past. New York: New Press, 2004. ISBN 1-56584-921-3. Raphael regards "Molly Pitcher" as a myth that serves to obscure the actual (though less dramatic) contributions of women to the war effort. The Real Pennsylvania Dutch American, "Molly Pitcher" – A Documented History. ISBN 1-4685-1019-3. Wikimedia Commons has media related to Molly Pitcher. "Molly, Captain" . Appletons' Cyclopædia of American Biography. 1900. This page was last edited on 14 April 2019, at 12:34 (UTC).